A striking characteristic of economic experience is the repeated occurrence of financial crises that usher in deep depressions and periods of low-level economic stagnation. American economist Hyman Minsky spent his life as a voice in the wilderness, but his ideas are growing increasingly popular as investors try to make sense of the Great Financial Crisis. Minsky’s main theory can be summed up in three words: stability is destabilising. Essentially, the longer the going’s good, the more risk investors take on, until they've shouldered too much. Eventually, the cash generated by their assets is no longer sufficient to pay off the mountains of debt they took on to acquire them. Losses on these assets prompt lenders to call in their loans, leading to a huge collapse of asset values – the Minsky Moment. Many believe China is now arriving at this dismal destination. But are they right? When Deng Xiaoping became China’s pre-eminent leader in 1978, his bold reforms sowed the seeds of an economic miracle. Three decades later, after sustained economic growth topping 8%, the People’s Republic was eager to blast through the “middle income trap” and join the ranks of the truly developed economies. Then came the Great Financial Crisis, which threatened these lofty ambitions by delivering a massive demand shock to the emerging world. Rather than let the Chinese economy falter at such a crucial time, the government unleashed its biggest-ever stimulus package. What followed was one of the largest credit binges in history. 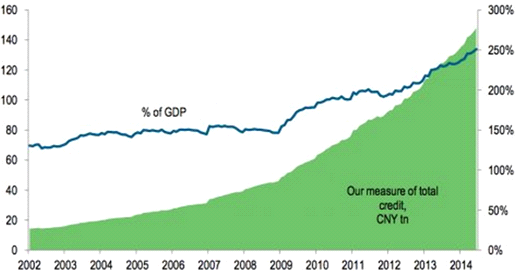 Since 2008, China’s total debt-to-GDP exploded from 150% to 250%, as can be seen below. Surges in national borrowing on this scale have almost always ended in a financial crisis of some sort, usually because more and more loans end up going to wasteful endeavours. Indeed, five years ago it took just over $1 of debt to generate $1 of economic growth in China. Last year it took nearly $4 – and, in a risky game of rollover roulette, one-third of new borrowing now goes to pay off the old. China’s shadow banking system, the country’s fastest-growing source of credit, has a lot to answer for. When conventional banks refused to lend to parts of the economy plagued by overinvestment, a range of non-bank financial institutions stepped in to fill the void. Within this murky world of alternative lenders, trusts are the most concerning. This $2 trillion sector has snowballed by financing frothy industries and local governments that often squandered the money on overblown vanity projects. Trusts have helped bankroll a truly extraordinary construction boom. 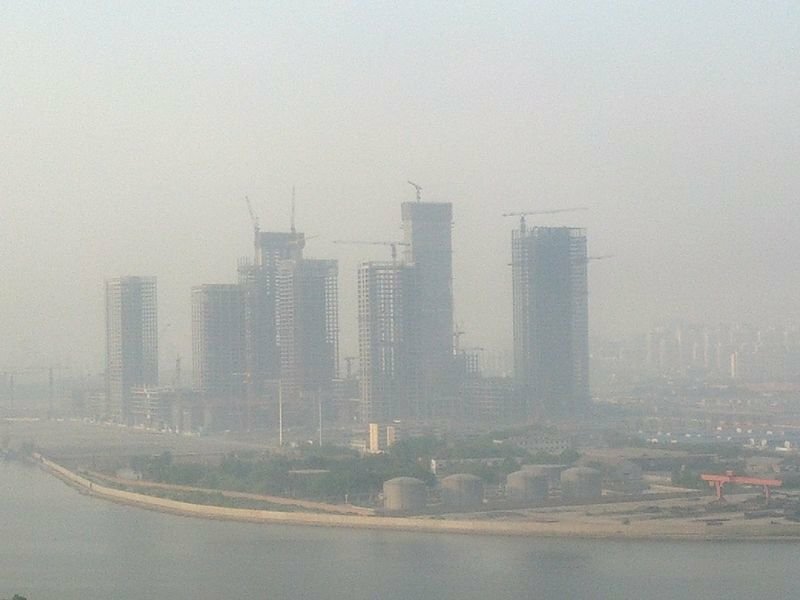 From 2011 to 2012, China produced more cement than the US did in the entire 20th century. Tales abound of ghost cities, roads to nowhere and forests of empty apartments. One particularly egregious project is Yujiapu Financial District – the great Wall Street of China. Here, on desolate salt flats on the far outskirts of China’s sixth-largest city, officials are constructing a business zone that will eventually be three times the size of its New York rival, complete with its very own imitation Rockefeller Center. This building boom has led to a chronic oversupply of real-estate: in many provinces, total floor space under construction could satisfy seven years of demand. Unsurprisingly, prices are beginning to stall. 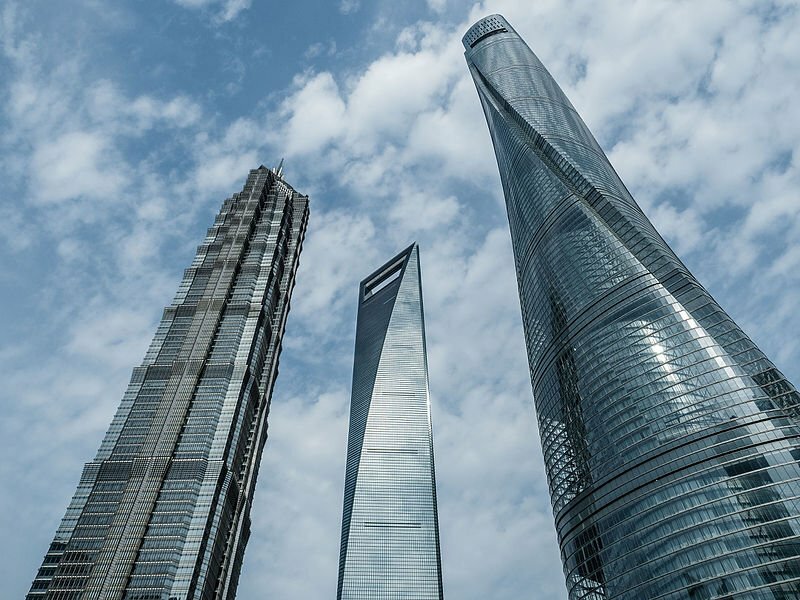 Given China’s profligate lending practices, its slowing economy, and recent warning signs from the property market, many now foresee a wave of defaults. This, they say, would cause market rates to spike and asset values to deteriorate as panicked borrowers sell to stay afloat. Lenders would choke credit off for all but the safest borrowers and economic growth would slow drastically – the Minsky Moment. We do not subscribe to this Armageddon scenario. Despite the country’s painful debt headache, China and its banks remain in rude health. Debt-to-GDP is still relatively low compared to developed economies including the US, the UK and Japan. Moreover, the vast majority of Chinese borrowing is domestically held and in the form of loans by state-owned banks to state-owned companies. These banks are very unlikely to risk a financial meltdown by calling in the loans. Even if a crisis did seem probable, the government could control it by stepping in to bail out borrowers on the verge of default. A version of this has in fact already occurred. When China Credit Trust recently announced that one of its investment products could have trouble making payments on time, a mystery buyer intervened to ensure that investors recouped their principal. Although the details remain opaque, it is likely that the government was behind the rescue mission. They could afford to repeat the bailout on a far grander scale. We know this by studying China’s sovereign balance sheet, which weighs up the country’s assets and liabilities. According to the IMF’s latest estimate in 2010, China was Rmb 70 trillion ($10 trillion) in the black. Although local government borrowing has ballooned by Rmb 12 trillion since then, Beijing still undoubtedly has the means to avert a financial collapse. However, the risk of disaster will clearly increase if credit continues to expand at its recent pace. It is therefore encouraging to see that the authorities are taking decisive action to arrest rising leverage and contain risks to financial stability. 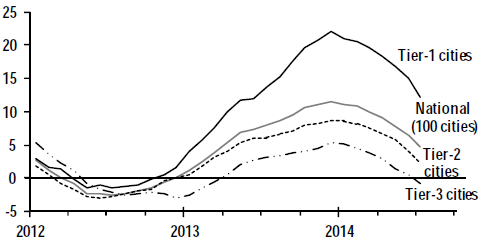 Shadow banking, property and infrastructure investment are now more tightly controlled. Most mortgages require a 30% cash down payment, while government-sanctioned audits of local authority borrowing send a strong signal that past largesse is no longer acceptable. At the same time, the government is deliberately loosening its grip over other areas of the economy. Interest rates, long kept artificially low by the authorities, are gradually being set free. This is important as the existing system distorts capital markets. It encourages speculative investment and allows banks to lend cheaply to state-owned enterprises – sometimes with little prospect of repayment – at the expense of more deserving private businesses. By increasing the role of market forces in the financial system, capital will be allocated more efficiently. There are signs that this is already occurring. Loans are starting to flow away from bloated state-owned enterprises towards more dynamic private businesses, which should help to foster sustainable economic growth. This is the key issue for China. The country must begin to prioritise high-quality, sustainable growth over high-speed growth at any cost. Reassuringly, President Xi Jinping and his Politburo comrades are acutely aware of this. Last year they committed to a sweeping reform agenda that promises to rebalance the economy towards domestic consumption and away from excessive investment and overborrowing. They are also creating a dashboard of more than 40 indicators to assess the efficiency and quality of growth. This will promote sustainable expansion by focusing on criteria such as economic stability, the environment and people’s living conditions. We therefore expect a “new normal” of slower, healthier growth and selective defaults as China’s excesses are gradually unraveled – the proverbial “soft landing”. Crucially, we believe a Minsky Moment is unlikely due to the government’s financial clout, its tight control of the economy, and the decisive action it is now taking to support financial stability.